Not many college students dream about a career in sales but that’s probably because they don’t know much about the profession. I certainly didn’t. Here are 3 reasons you should considering joining the profession that employs 11% of the US workforce. No one wants to be a cog in the wheel. We want to know that our hard work is both being appreciated and that it is impacting the business in a significant way. I can’t think of a better way to make a huge impact than signing a major customer or generating millions of dollars for your company. I hired a Sales Development Rep at Ooyala once that prospected into a Japanese anime company his first month on the job. Within 45 days, the Account Executive won the account which was one of the largest contracts in company history. This SDR was just a few months out of college and getting high fives from every executive at the company. That’s not a bad way to start your career. You might not have a whole lot of independence early in your career but once you establish yourself as a top performing Account Executive you can pretty much come and go as you please. Go take lunch meetings, work from home, book travel. Just make sure you hit your quota every single time and your manager will likely let you do what you want. I had a field rep once that went to Maui for 2 weeks after the close of every quarter. (That’s 8 weeks a year.) She always hit her number and when she was in Maui she would get up at 5am local time and work until noon. If I thought she was slacking off I would have said something but she always delivered so I let her work from wherever in the world she wanted to be. You shouldn’t join this profession for the money but it’s certainly a nice perk. When I was in college I had no idea how much money sales reps made. I remember the first time someone told me the top sales reps are often the highest paid employees at a company and even make more than the VP of Sales and CEO. I didn’t understand why until a CEO informed me that he has no problem paying seven figures a year to someone bringing in eight figures a year. “I like writing big checks to sales reps” he said. Sales is a beautiful profession that I hope more and more college graduates consider. It’s certainly not easy and it’s certainly not for everyone. If you’re up for a challenge and want to test your ability to understand and solve business problems with technical solutions, then perhaps you should give it a try. You may just find out you love this profession as much as I do. I’ve enjoyed sales so much I recently started Sales Bootcamp to help individuals break into the sales profession. If you would like to learn more about sales please check out Sales Bootcamp at http://salesbootcamp.com. 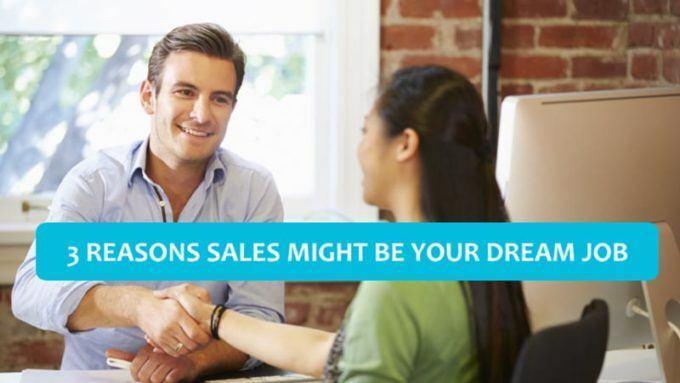 My team and I would be happy to help you start your sales career.